Arts such as paintings and calligraphies are painted or written on fragile media like papers or silk, but regular restoration has allowed them to survive several centuries and even a millennium until today. 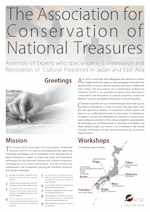 The Association for Conservation of National Treasures (ACNT) is an assembly of experts who specialize in conservation and restoration of cultural properties, mainly the National Treasures and National Important Cultural Properties. Cultural properties are our national treasures that make up our cultural foundation. In order to protect and pass them onto the next generation reliably, it is essential to inherit, polish, and improve our traditional art based on many years of experiences. In addition, we are now demanded to respond to various issues surrounding conservation of the cultural properties appropriately, by leveraging our creativity based on abundant knowledge and deep cultural insight. Our mission is to contribute to the society through conservation of the cultural properties by promoting these activities. We deeply appreciate your further support and guidance.